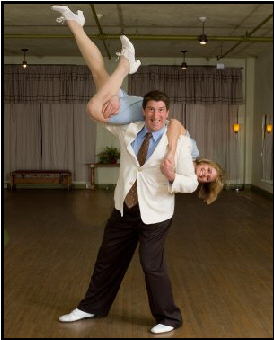 Terry and Kandy began Swing Dancing in 1998 at the Swing Lounge and Jefferson Hall in Cincinnati. They immediately fell in love with Lindy Hop. Soon thereafter they began traveling around the Country taking lessons, attending workshops, and learning from the best the Country had to offer. They have studied with Ryan Francois & Jenny Thomas (Choreographers for Swing Kids, Malcolm X and Swing! The Musical), Steven Mitchell, Virginie, and Kevin St. Laurent, Carla Heiney (Dance Fever fame). They began teaching, performing and competing in 2000 and have won awards for “Taking Christmas to the Troops” with the Rising Phoenix Theatre and Swing! for the Drama Workshop. They have also performed at the National VFW convention to a standing ovation. They regularly perform at the annual Cincinnati Warbirds dance on Memorial Day weekend. 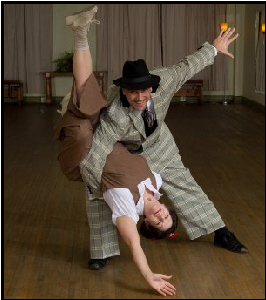 Jesse & Greta are mainstay teachers and dancers at the SwinGallery where they have been there since the very beginning. Greta is actually the author of the name the "SwinGallery". Both instructors have studied with world class instructors and devote hours promoting, performing and maintaining Lindy Hop in the greater Cincinnati area. They have performed all over the city and traveled the Country learning and perfecting the art of Lindy Hop. Joel Domoe & Melanie Myers have been dancing, competing, performing, teaching and studying swing dance constantly in a variety of capacities since 1995. They’ve literally taught thousands of people to swing dance and are excited to be part of the Cincinnati community since moving back in 2006. Melanie has performed at the White House and the Kennedy Center with the Baltimore Flycats. Among their competitive credits are Joel’s 1999 Virginia State Open Showcase Jitterbug Championship and Melanie’s first place with the Flycats in the 1997 Virginia State Open Team Competition. Together they are the 2000 Atlanta Summer Swing Jam Strictly Lindy Champions. Both have served as judges for numerous competition events around the country, They have two children, Nicole and Jordan.